Discussion in 'Power Supplies' started by FrgMstr, Jan 21, 2019. ASUS is getting back into the computer power supply game in a big way. Today we have the Republic of Gamers Thor 1200 that promises to allow you to "HARNESS THUNDER." This is a massive 1200 watt PSU and the first thing that will catch your eye is the OLED panel that will tell you just how much power your a using at the moment. AceGoober, DrezKill, primetime and 2 others like this. Did they send you one from retail stock? No. Only Seasonic does that. No pics of the OLED screen in action? It's the one thing that really sets this PSU apart. I can't even tell where it's located at from what's in the article - is it built into the PSU, is it a detachable screen that goes in a 3.5" bay, not sure. Granted, I am also too lazy to click over to any other site to go looking as well, just found it odd there were a lot of mentions of the screen, but no actual pictures. Also, as a side note - Harness Thunder... yeah. I could see Harness Lightning, and that would be legit. I think Google Translate failed the marketing department there. I am now going to tell my family I am simply "harnessing the thunder" every time I flatulate from here on out. Seriously, one side of the thing is an OLED panel? Have we jumped the shark on PSUs now? Well, I'm not their target market anyway, I'm a SeaSonic guy. Imagine white numbers in the screen there and you have it. Not gonna lie, you guys had me at Thor 1200 watt. Next was Asus. They've gained a foothold in my builds in the last 2-3 years with Strix TI GPU's and my first G-sync display. I also keep an eye out for PSU's because modern day top tier GPU's do demand some power. Throw in some heavy OC'ing on some CPU's and you'll still find yourself back to needing the sweet optimized spot of 500 or so watts. That being said then 1000-1200 watts PSU's still have a place for those who don't SLI still. Thanks Kyle and Paul for the review. If I didn't already have a backup PSU in a new/sealed box I'd consider this as a backup for my 4930k/2080TI rig. Only thing holding me back would be price(ouch) but it's nice to hear the quality is there. My favorite from them back in the day and totally appropriate to this. Nice first showing from Asus. It is a good choice to go with a Seasonic built psu. 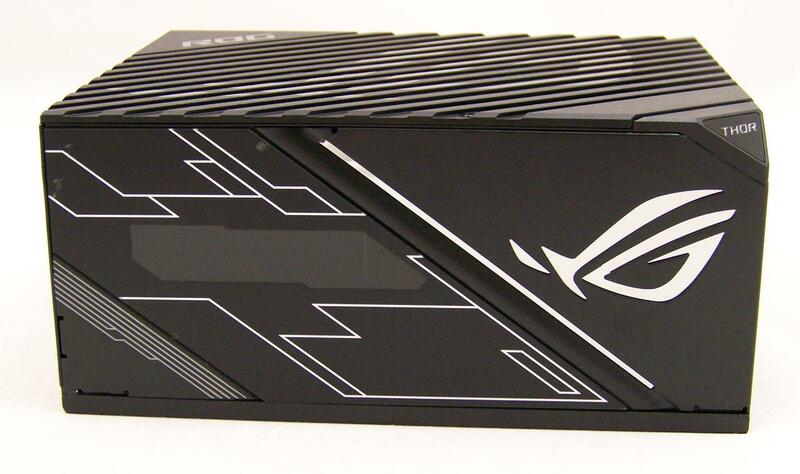 But that price, you really need to be all in on the ROG brand to want this over a comparable psu. That built in display is an interesting addition though. The geek in me thinks its kinda neat but my logical side is unsure of any true benefit it could bring to a build. If it was something we could mount anyplace on the case it would be much more useful. Any chance that we may see the 850 watt version reviewed? AceGoober, DrezKill, AlphaQup and 1 other person like this. i was REALLY wanting to see the display lit up as well....Cause i never seen one before either...i also would like to see any rgb type stuff as it works as well If i were gonna buy it, if be looking online to try and see it. Asus website linked has full pics. Just an OLED screen. Ok thanks, I will not be adding ASUS PSUs to my recommended list. This one is built by Seasonic. AceGoober, DrezKill, Ranger101 and 1 other person like this. Love the idea of the screen. Not sure telling the customer just how little power their rig actually uses is in the best interest of a company trying to sell 1200w PSUs though. AceGoober, DrezKill, IKV1476 and 3 others like this. Start overclocking your high end HEDT and it will becoming a necessity. AceGoober and DrezKill like this. I have decided that a review unit coming from retail stock and the [H] review are very important to me and my PSU buying decision. A PSU must have a great review here and the review unit came from retail stock to make my list. AceGoober and FrgMstr like this. Im sorry but i cant see me ever having a need for more than a 850 W PSU can handle, maybe that's due to the off the wall price for 1 KWH here in Denmark. Getting a large PSU does not mean you consume more electricity automatically although its efficiency is affected by usage. There are other factors to consider though. For example I bought the Corsair AX1500i not because I need 1500Watts but because it was the best thing out there (before the 1600i) and it works passively in my rig (no fan spinning) because 99% of the time I am at below 50% of its max capacity - NO DUST - NO SOUND at all from the PSU. AthlonXP and FrgMstr like this. Kind of considering that because right now I can get a 1200W EVGA P2 psu for only $15 more then an 850W. Just check its efficiency curve vs your estimated average daily power usage and make sure that the fan turns off when below that threshold. That is if you care about it of course. Cool, I can do that. But yeah its only $15 more for a 1200w over an 850w. The only issue I have is that I need to shift my wires a little since the PSU is longer. As far as I'm aware the fan on my Corsair AX750 has never spun after the POST. Hi Kyle, thanks for another great power supply review! I have a doubt not directly related to the PSU reviewed but about PSU fans in general, i'm almost buying the corsair RM1000x, but it has so called rifle bearing, and the RM1000i has the Dynamic Fluid one, in my country there is a substancial difference in price, how much it really matters in the long term? Who is your editor? "tells you just how much power your a using"? That would be me. Thanks for the heads up, I will get it fixed.